These are now available at an even better price. 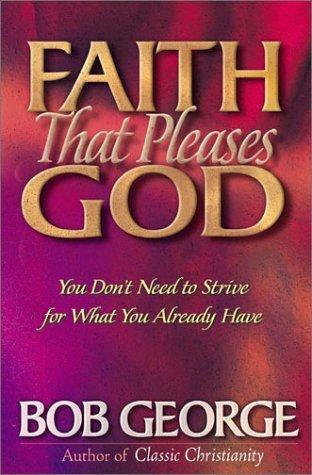 You will receive a 10% discount on orders of 10 or more Faith That Pleases God books. But then marred somewhat (for me) by Bob's statement that Christ gives His life to you so that He can live His life through you..? This statement seemingly intimates that we are to become like puppets with God pulling the strings? My personal belief is that the life of Christ is given to us to empower us and enable us to live the christian life, that we retain our autonomy at all times.... at least then our praises and responses to God will be genuine and have value to Him. Maybe it was just a bad choice of words as Bob clearly indicates elsewhere that we are to be led and guided by the Holy Spirit...? But apart from this statement, there was lot's of good solid teaching and guidance given in this book. I am halfway through this and am already wanting to start over. It is so rich. Truly a book worthy of our attention. Once again Bob explaining the simplicity of the word of God. who we are under a New Covenant what true faith is and resting in them. Bob has done it again. You will find you can stop holding your breathe now and live your life the way God wanted you to , remembering as Hal Lindsey said --"the 11th commandment--don't sweat it". God really does have a plan.